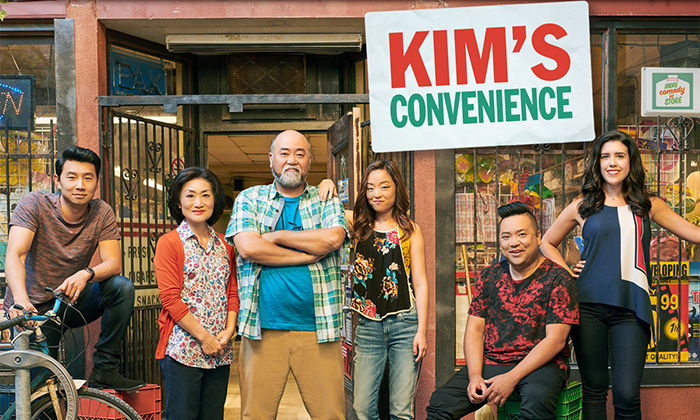 The Canadian sitcom "Kim’s Convenience" on CBC Television tells of a Korean-Canadian family that runs a convenience store in Toronto. From left: Jung, the son; Yong-mi, the mother; Sang-il, the father and store owner; Janet, the daughter; Kimchi, Jung's friend; and Shannon, Jung's boss. The acclaimed sitcom "Kim's Convenience" has started its third season on Canada's national public network CBC Television. Based on a stage show of the same title, the comedy show is about the Kims, a Korean immigrant family that owns a convenience store in Toronto. With the third season starting on Jan. 8, the series explores generational differences between immigrant parents and their children raised in a new land and small misunderstandings with locals due to cultural differences. Speaking in a Korean accent and occasionally using Korean words, the parents often stick to their nationalistic and traditional ways of life that often appear awkward and funny in modern-day Canada. Mr. Kim, the father and store owner, immediately reports a Japanese vehicle in a no-parking zone but ignores a Korean car guilty of the same offense. When his daughter Janet brings her non-Korean date, the first question her father asks is what is the date of Korea's National Liberation Day. Mrs. Kim, the mother and ardent Christian, urges her daughter to get a Korean boyfriend who is also a church-attending Christian. She is also a typical Korean mother who fills up the fridge at her son's home with several dishes of food in Tupperware. "Kim's Convenience" also reflects generational differences immigrant families often face that viewers can sympathize with. Jung runs away from home after numerous fights with his father, who never says sorry, but implicitly makes up when he looks after his sick dad asleep on a hospital bed. Janet, often frustrated by her parents prioritizing their son before her, makes peace with a reality that does not change. The show also features Korean practices that Westerners might find hard to understand such as ddakbam, or flicking a finger on the forehead that could be deemed child abuse in the West, and ddong chim, a wedgie prank using one's index fingers to poke someone’s pants in a way that could be seen as sexual assault abroad. The Korean term "service," which refers to a free gift given to regular customers instead of its conventional meaning in English, is another example of how the show educates about Korean customs. 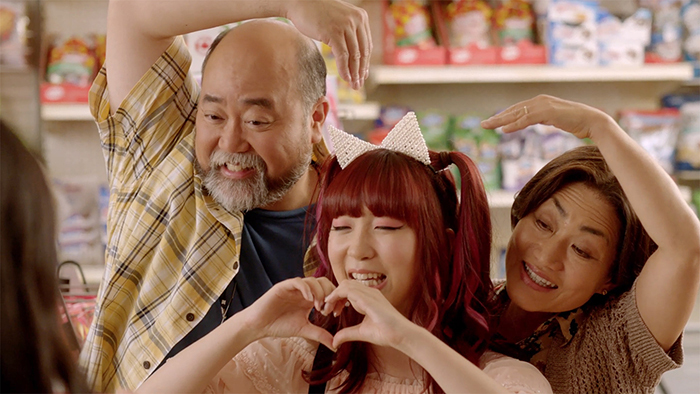 In this "Kim’s Convenience" episode, Mr. Kim (left) and Mrs. Kim (right) make love hearts, a common practice in Korea when posing for photos, with their niece Nayoung visiting from Korea. Premiering in October 2016, the sitcom gathered some 930,000 viewers in three months to become the third most-watched show in its time slot in Canada. Winning numerous TV awards in 2017 and 2018, the show was renewed for a third season. In Korea, the cable channel TV Chosun began airing the show on Jan. 5. National Public Radio (NPR) of the U.S. attributed the success of the show to "archetypes, not stereotypes," in a Jan. 9 article, adding, "Kim's Convenience also offers something else: well-rounded Asian characters who have depth."